In the world on the brink of annihilation, a great evil seeks to conquer the earth. Only the ancient enchantment has long hidden the existence of magic and the dark realms from humanity. Will it only serve to blind mankind from their one chance at mounting a defense against the coming onslaught? 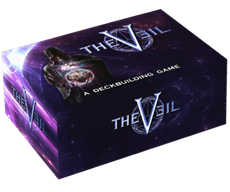 The answer lies beyond The Veil - in a new dark fantasy deck building game by Logan Gendron. Pick one of the thematic decks and defeat your opponents in a character driven combat. deck building mechanics include a private market for each player allowing characters decks and abilities to be thematically appropriate to their class. Villain characters are more powerful permitting dynamic 1 vs 2 games while eliminating the problems of traditional free-for-all matches. A choose-your-own-adventure style campaign mode that allows 1 to 5 players to immerse in the the story of the world.